Germinal Epithelium. This simple squamous or low cuboidal-type epithelium covers the free surface of the ovary. Tunica Albuginea. 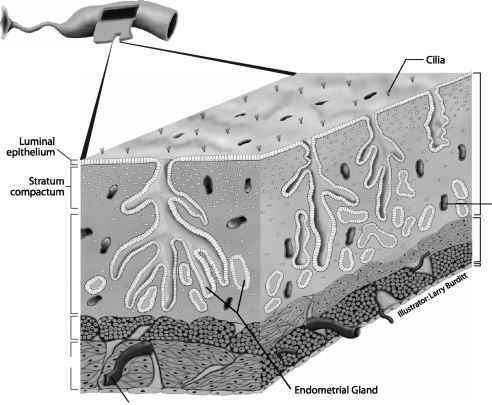 This dense connective tissue beneath the germinal epithelium supports the structure of the ovary. Cortex. 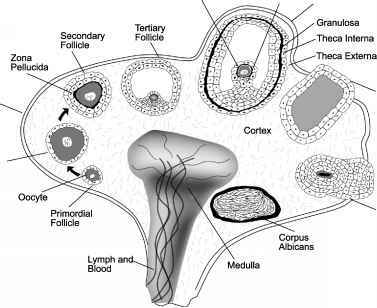 This outer connective tissue of the ovary contains follicles. 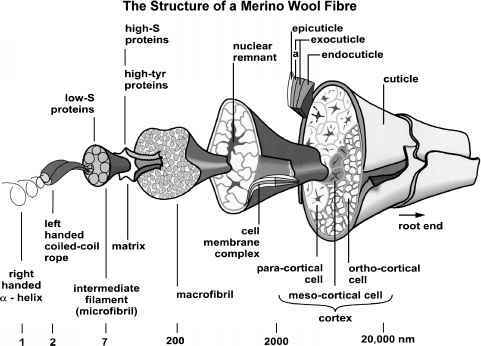 Medulla. This inner connective tissue is highly vascularized and innervated, but lacks follicles except in equids. Fig. 2 Schematic illustration of the ovary showing the primary structures and their sequence of development during the ovarian cycle. membrane of the ovum. These follicles produce estrogens that induce an ovulatory surge of luteinizing hormone (LH) for ovulation and release of the ovum into the oviduct. Following ovulation, granulosa and theca cells form transitional structures on the ovary known as: 1) the corpus hemorhhagicum (CH), a newly ruptured follicle containing a blood clot and proliferating granulosa and theca cells; 2) the corpus luteum (CL), with yellow body or solid glandular structure formed through hyperplasia and hypertrophy of granulosa and theca cells (one CL forms from each ovulated follicle to secrete progesterone, the hormone required for pregnancy); and 3) the corpus albicans (CA), the white body or connective tissue remains of the CL that regress due to effects of luteolytic prostaglandin F2a if pregnancy is not established.